The Ottoman Turkish writer Evliya Chelebi or Çelebi (1611-1684) travelled extensively through the Ottoman empire and neighbouring countries from 1640 to 1676 , both in a private capacity and at the service of the Sublime Porte. The account of his travels is recorded in his ten-volume Turkish-language Seyahatname (travel book), which he completed in Cairo. The Seyahatname contains a wealth of information on the cultural history, folklore and geography of the countries he visited. Chelebi travelled through Kosova in December of 1660 on the occasion of the transfer of his patron, Melek Ahmed Pasha, from Banja Luka to Sofia. In the following text, he describes the journey, in particular his visits to Zveçan, Mitrovica, Vushtrria, Prishtina and Kaçanik, before he continued on to Skopje. From there [Yeni-bazar], in ..... hours, we arrived at the lofty fortress of Mitrovica. The name in Latin (1) meaning ..... . It was built by King Seleshti (? ), (2) one of the kings of Serbia. This town was conquered in person by Ghazi Khudavendigar, Sultan Murad I, son of Orhan Ghazi, in the year..... . During the Battle of Kosovo Polje, Sultan Murad put 700,000 infidels to the sword. While he was going about the battlefield on foot, and the bodies of his martyred soldiers were being piled up on the bank of the Llap river, an inauspicious infidel called Koblaki (?) (3) rose from among the carcasses of the infidel soldiers and slew him. According to another version the assassination took place after the battle, when the aforementioned infidel, pretending to be an envoy, approached to kiss the hand of the sultan, but then drew his dagger and slew him. He then mounted his horse and set off in flight. A huge number of Ottoman troops rushed around him with their weapons, yet no one was able to knock the assassin off his horse. An old woman cried out: "Oh warriors, strike his horse on the hoof, for both he and his horse are entirely covered in mail." As soon as she said this, a strong-armed bowman shot at the horse's hoof, and horse and rider both came tumbling down. The soldiers crowded around, broke through his mail collar and slit his throat. Ever since that time, whenever an envoy approaches one of the Ottoman dynasty, the sultan sits on his throne and the envoy kisses a long sleeve attached to the sultan's robe while being held tightly on both sides. The envoy is first made to kiss the ground, and then the sleeve, which is eight paces in length, and he is not allowed any nearer. That has been the custom under Ottoman law since the day on which Ghazi Khudavendigar was murdered. Because of that incident, this lofty fortress of Mitrovica is called The Inauspicious Fortress. Situated at the extreme western point of the Kosova plain, it is not dominated by any higher ground. It is oval shaped and constructed of chiselled stonework. It is extremely solid and cannot be undermined with trenches or tunnels. There is a single gate. Inside, there are no memorable buildings. At the base of the fortress flows the ..... river, which originates in the mountains of Peja (4) in Albania, joins the Llap river, and flows down until it joins the Morava. 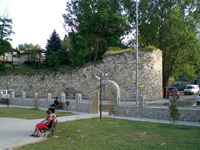 In these regions, this fortress is called Mitrovica of Kosova. There is also a fortress called Mitrovica of Srem, (5) but it is in ruins. At bowshot range from the fortress is the shrine of Mustafa Baba, with a tekke inhabited by Bektashi dervishes, where travellers can spend the night. Near this tekke is the town of Zveçan, at the utmost frontier. This is where the eyalet of Bosnia comes to an end. All the notables from the nearby regions of Rumelia gathered at this place in grand procession to wish our master the Pasha a safe journey. They slaughtered animals and distributed the meat to the poor. Our master the Pasha performed two prostrations at the Zveçan mosque and distributed alms. This prosperous town on the Kosova plain consists of 300 houses with tiled roofs. It has a congregational mosque, a han, a bathhouse and several fine shops. It is the seat of a magistrate and a voyvoda. This town constitutes one end of the eyalet of Bosnia, the other being in Montenegro. The elayet is bordered on one side by Podgorica, Kelmendi and the fortress of Kotor; on another by Venetian Dubrovnik; on another by Burun Kullesi (Cape Tower) and ------ (? - illegible); on another by the towns of Pupuška, Primorje and Split; to the west by Šibenik and Zadar; to the north by Zrin; on another side by Kanija in the sandjak of Cernik; on another by Požega; on another by the Elayet of Buda; on another by Zvornik in the sandjak of Srem; to the east by Rumelian Alaca Hisar; and to the south by this Zveçan and the sandjak of Vushtrria. It is a great and populous eyalet, and there are no better fortresses in any other region. Now follows a description of the towns and villages of the eyalet of Rumelia. 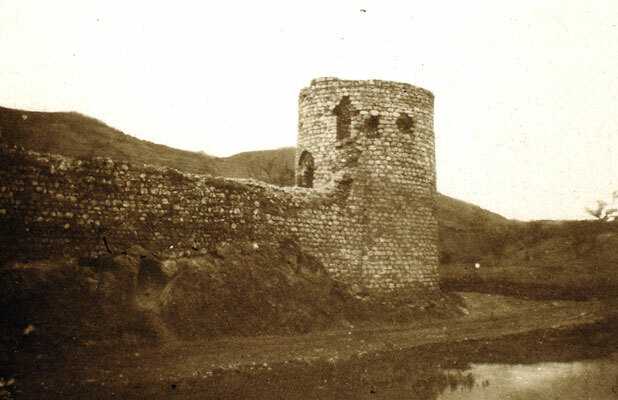 Leaving the town of Zveçan, we travelled south for 7 hours across the boundless plain of Kosova and arrived at the ancient sandjak, the walled town of Vushtrria. (6) The name in Latin meaning ..... . It was founded by the kings of Serbia. In 792 (1389), it was conquered in person by Ghazi Khudavendigar. After the conquest, the fortress was razed so that it would never again be a refuge for the infidels. The foundations are still visible. 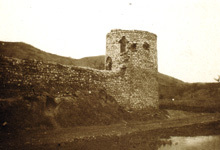 It is the seat of a sandjak bey in the eyalet of Rumelia, and is an imperial grant to the bey with an income of ..... akçe. The sandjak includes ..... zeamets and ...... timars. It has an alay-bey, a çeribasi and a captain. According to statute, it must muster 4,000 armed men including the armed retainers of these timariots and the soldiers of the bey. It has a mufti, a nakibülesraf and a kadi with a salary level of 150 akçe. There are ..... surrounding villages. It also has a steward of the sipahis, a commander of the janissaries, a market inspector, a collector of tolls, a poll-tax official, plus dignitaries and notables. There are a total of ..... quarters, of which the most famous are the quarter of the Martyrs, the Alay-bey-zade quarter, the Old quarter, the Upper quarter and the Lower quarter. There are 2,000 one- and two-storey houses in good condition, made of stone and with tiled roofs. Altogether there are ..... prayer-niches. First of all, in the marketplace, is the Eski Cami (Old Congregational Mosque), supported by pious foundations established by Khudavendigar (Sultan Murad I). ..... All the rest are neighbourhood mosques. There are a medrese, tekkes, schools and several hans. Near the courthouse is a dingy bathhouse. The marketplace is small, with no covered bazaar or eating establishments, but all the houses in the town show great hospitality to travellers. Before the campaign to conquer Crete began (7), the mansions of 150 dignitaries and notables were closed up, and for this reason the town has fallen into decay. God willing, its prosperity will be restored, since it is situated on the broad and fertile plain of Kosova and is blessed with a delightful climate. It is an isolated town, whose territory at the foot of the Novobërda mountains has many vineyards and gardens. Through this part of the plain flows the Llap river, which has its source in Albania, (8) joins the ..... river at the foot of the aforementioned fortress of Mitrovica, and then joins the Morava river, which flows into the Danube. The inhabitants of Vushtrria are Rumelians. Most of them do not speak Bosnian, but do speak Albanian and Turkish. They wear broadcloth garments and frontier-style red calpacs with low crests of fur and sable. They turn around (?) the fur of their calpacs, and black silken fringes are visible on the edges. They have teybend waistbands, carry knives of the kortela varsak variety, (9) and wear red trousers with silver buttons and elegant kubadi shoes. Such is the fine dress of the Rumelians. We set out from this town following the banks of the Llap across the plain of Kosova, heading south. The radiant shrine of the martyr sultan, Ghazi Khudavendigar, may his earth be sweet, may God hallow his mystery. We visited the site, situated in a wilderness on the banks of the Llap, where the noble heart and other internal organs of our martyred Sultan Murad I lie buried in high domed mausoleum. As I indicated above, a great battle took place here in the year 792 (1389) in which the damned and inauspicious Koblaki martyred such a marvellous sultan. The sultan's belly was slit open and his kidneys, liver and heart were removed and buried here. Later this lofty mausoleum was constructed by Sultan Bayezid I the Thunderbolt. There have been ..... great battles in the Ottoman empire. The first was this one of Kosovo Polje. Another was the battle of Sultan Bayezid I the Thunderbolt. (10) Another was the battle of Murad II, father of Mehmed the Conqueror, (168b) against the Vlachs and Moldavians in the Ughrash (?) valley near Varna. (11) Another was the great battle which took place in the valley of Tercan near Erzurum between Mehmed the Conqueror and Sultan Uzun Hasan of the kings of Azerbaidjan in the year....., dated according to the chronogram "Void is the scheme of the traitors". (12) Another was the battle of Chaldiran in the year ..... between Shah Ismail and Selim Shah. (13) Another was the Battle of Mohács in the year ..... when Suleyman Khan slew King Lajos along with 700,000 infidels. (14) Another was the battle on the Mezö-Keresztes plateau near Erlau in the year ..... when seven kings perished along with 700,000 infidels. (15) Praise be to God that in the seven aforementioned ghazas, the infidel kings were all slain. After the battle of Kosovo Polje, however, Ghazi Murad Khan was slain by a ruse as he took his rest, and his noble heart was placed in this radiant shrine. As for his blessed body, it now lies buried in the sublime mausoleum that is in the courtyard of the Great Mosque in the place called Eski Kaplica (Old Hotspring) in Bursa and is a place of pilgrimage. A strange thing occurred as we entered this mausoleum of Kosovo Polje. Even the skirt of our master Melek Ahmed Pasha was besmirched with filth. It seems that all the rayah infidels from the surrounding villages used to stop at this mausoleum on their way to Prishtina and Vushtrria and, as an insult, use it as a privy. Melek Ahmed Pasha became enraged when he noticed the stench and filth. "My lord," said I, "the inauspicious infidel who slew the sultan lies in a monastery on yonder mountain in a fine mausoleum, lit with jewelled lamps and scented with ambergris and musk. It is supported by wealthy endowments and ministered by priests who every day and night play host to passing visitors, infidel and Muslim alike. The mausoleum of our victorious sultan, on the other hand, has no such institution or keeper to tend to it, and thus all the infidels come and treacherously deposit their excrement in it. You ought to summon the infidels from the surrounding villages and have them clean and repair the mausoleum. With a yük (= 500,000) of akçe drawn from the imperial grant (has) of Zveçan, strong walls could be built around it and a keeper could be appointed to live here with his family." Thereupon, the pasha gave the populace of the vilayet two purses of kurus and summoned the rayah from the surrounding area to clean up the mausoleum. In one week they built a high wall with a lofty gate around the mausoleum so that people on horseback could not get in. They also planted 500 fruit trees and dug a well. A keeper was appointed to live there with his family, receiving a regular salary from the voyvoda of Zveçan. His duty was to care for the silk carpets, candlesticks, censers, rose-water containers and lamps in the radiant mausoleum. At the same time, the notables of the vilayet appointed an official to oversee this charitable institution. Thus a great act of charity was accomplished, and now it has become a pilgrimage site - God's mercy be upon him! There are a total of 12 prayer-niches, of which six are congregational mosques. First of all, in the bazaar, is ..... . The rest are neighbourhood mosques. There are ..... medreses, ..... hadith schools, ..... primary schools, and ..... dervish tekkes. There are ..... fountains and ..... public water-dispensaries. There are 11 hans. The han of Hadji Bey has the following chronogram: "Proudly the date is said in words: / This han was built in 1032 (1623)." (169a) There are other khans in the bazaar, but no public buildings with leaden roofs. Although there is no stonework covered bazaar, there are 300 shops, which are actually too few for the size of the town. Nonetheless, everything can be found in them. From here we set off and arrived at the village of Dobratin, (16) which is Latin for ..... . It is a free zeamet and is a fair, prosperous and fertile village of some 500 houses. From there we journeyed eastwards and arrived at the fortress of ..... i.e., Kaçanik. The origin of this name is that some Albanian brigands once conducted a raid on the town of Skopje and then fled as far as this point where, expecting to find a halting-place, they were massacred instead. So it was called Kaçanlar ("Fugitives"), which became corrupted to Kaçanik. Later, in the year ..... , Sinan Pasha, the conqueror of Yemen, constructed a beautiful stonework fortress at the mouth of the gorge and on the banks of the Lepenca river. It is square in shape and 800 paces in circumference. One drawback is that it is situated in a valley and so has many higher points surrounding it. The castle has a warden, 50 garrison soldiers, two cannons and one gate. Inside are 40 to 50 houses to accommodate the soldiers, but no public buildings. Outside the walls there are another 100 houses, all with tiled roofs and gardens. The town contains one delightful congregational mosque, above the threshold of which is the following chronogram: "By God, a well-wisher has uttered its date: / A fair temple and praiseworthy site. 1003 (1594)." There is one Bektashi tekke, one primary school, one great han, situated at the foot of the cliff and one small bathhouse. There is no sign of a bazaar, since Skopje is nearby. The ..... river flows through Kaçanik, continues through these valleys, and is conducted via the Ghazi-Isa-Bay aqueduct to Skopje where the water is distributed to the hans, bathhouses and medreses - a splendid public work! Kaçanik is the seat of a kadi with a salary level of 150 akçe, and the office has been granted in perpetuity to the descendants of Veysi Efendi of Skopje. It is ruled by a voyvoda as part of the sandjak of Skopje. From here, we set off on the Skopje road and, after visiting the shrine of the Forty Saints, arrived in Skopje after ..... hours. In Evliya's usage, 'Latin' means Slavic. Cannot be identified with a historical figure. Elsewhere, Evliya gives the name Milos Qoblaki. The asssassination is traditionally attributed to one Miloš Kobilic or Obilic. Town in western Kosova, BCS Pec, Turkish Ipek. Formerly known as Vuçitërna, BCS Vucitrn, Turkish Vuçitirin. In 1645. The campaign ended with the victory at Candia in 1669. The Llap (BCS Lab) river is a tributary of the Sitnica and Ibar, and does not originate in Albania. The specific meaning of these terms is not wholly clear. The battle of Nicopolis, 789/1396, when Bayezid defeated the crusading army under King Sigismund of Hungary. The battle of Varna, 848/1444. The battle of Baskent against the Akkoyunlus, 878/1473. Sultan Selim I defeated the Safavid Shah Isma'il I, 920/1514. Sultan Suleyman I defeated Louis II, King of Hungary, 932/1526. The battle of Hachova (Mezö-Keresztes), 1005/1596, in which Sultan Mehmed III defeated the Emperor Maximilian. Village to the east of Lypjan.